The agility afforded by blogging means nothing if you sit on your ideas for months or let half-written posts rot in your draft folder. That’s a lesson I learned today when I discovered a host of recent references to Masahiro Mori’s famous graph of the uncanny valley, mostly in reference to zombies (see posts by Nathan Gale, Ian Bogost, and Fabio Cunctator). I’d been toying with some ideas about the uncanny valley since April and I even had a bit written in July, but I set it aside while I went on to other things. And then boom! — the uncanny valley is everywhere. I had planned on delving into Freud’s lovely essay on the unheimlich, or the uncanny. I’ll save that for a later date, only mentioning that for Freud, the uncanny was that which “ought to have remained secret and hidden but has come to light” — in other words, the return of the repressed. Right now, though, I”ll get straight to my own small contribution to the discussion on the uncanny. Mori derived this theory from his observations about the way some robots (the ones that seemed almost human but not quite) would freak people out while others (the cute ones) would not. What I like about Mori’s graph is that he distinguishes between moving and still objects. Moving objects can seem more lifelike, but by the same token, they plunge deeper into the uncanny valley than a still object, a difference shown on the graph by the space between corpse and zombie. This difference between moving and still objects is something that’s left out of the popular conception of the uncanny valley, where it is usually applied to visual representation, i.e. a kind of cinematic or photorealism. But what about realism in movement? Realism in actions? So back in April I came up with a separate graph (larger image), intended to help us think through the way actions enacted in a videogame can be uncanny. The question raised by the graph, then, is what kind of simulated actions plunge us into the uncanny valley? Though it’s not a videogame (yet) and it breaks the house metaphor (The German word for uncanny, unheimlich, literally means un-homelike), waterboarding fits the bill as a kind of uncanny simulated activity — so close to real world drowning but, ah, not quite. Back to games, using your WiiMote to saw off the head of a deranged murderer in Manhunt 2 would likely qualify as an uncanny action to many people, gamers and non-gamers alike. But that’s an obvious example. What else might go down in this valley? I’m looking for games in which the bodily motion of the gamer engaged in a simulated activity approaches asymptotically the real world motions of the source activity. And an even more critical question to ask: should designers make games that take us into that valley? Now that we have Wii Remotes and Wii Boards and the Wii MotionPlus, games no longer have to rely on the haptic density of button-mashing. We can and do play games that involve our whole bodies, games that traverse the left side of the graph. My answer is absolutely yes, games should take us into the uncanny valley of action. Whereas the uncanny valley in visual representation is something designers strive to avoid (unless they’re programming zombies, in which case, you want uncanniness, which in my mind accounts for the popularity of zombies in videogames and CG-based movies — zombies are great matches for the current level of technology!) 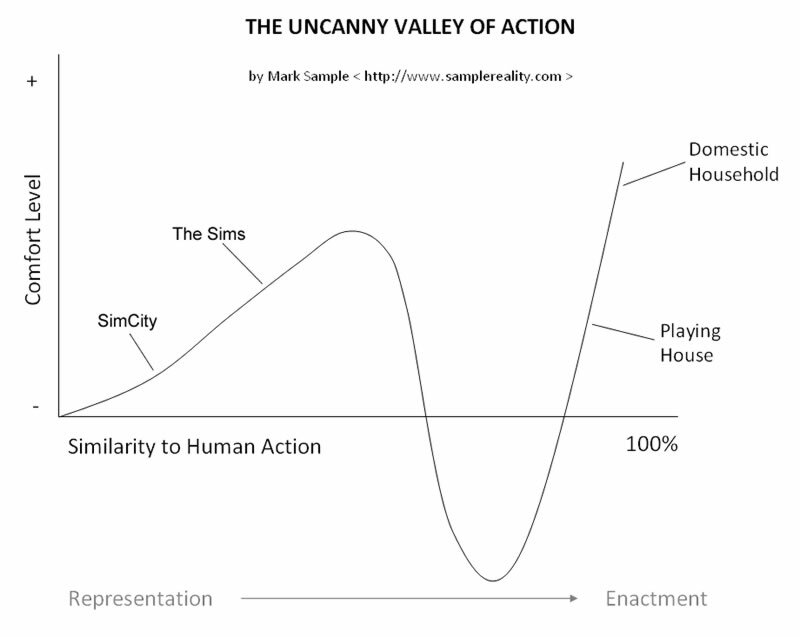 — the uncanny valley is something to strive towards when it comes to motion and action. Discomfiting bodily actions required by future games might have a Brechtian effect on the gamer, exposing what Ian Bogost calls in Unit Operations the “simulation gap” — the “gap between the rule-based representation of a source system and a user’s subjectivity” (107). And the revelation of this gap would not simply be an intellectual realization, but a felt bodily experience, flooding through the entire presence of a person. This is something books can’t do, nor movies. Until we have holodecks, uncanny games may be the best way to understand the physical lives of other people. Huh, interesting. I wonder… could we say the same thing of the visual/robotic uncanny valley? That is, ought its purpose also be to disturb and defamiliarize the human, in order to draw attention to it (like the unheimlich), rather than to overcome it through technological mastery or to avoid it through representational abstraction? Good question. Personally, I think yes. A movie like District 9 does precisely this, using the uncanny to defamiliarize the human. One thing I’ve always wondered is how much of the uncanny (whether visual or action) is rooted in learned cultural behavior and expectations. When I teach the original Mori graph, students are always stumped by what a bunraku puppet is. After looking it up online and discovering some really creepy (to our eyes) puppets, my students are shocked that bunraku puppets are in the positive, familiar slope of the uncanny valley rather than deep in its pit. It goes to show that what is unfamiliar depends on what counts as familiar.